By William Mackay: Instead of Manny Pacquiao or Amir Khan getting the next fight against World Boxing Council (WBC) welterweight champion Floyd Mayweather Jr, it could end up being WBA light welterweight champion Marcos Maidana (31-2, 28 KO’s), says Mayweather’s trainer Roger Mayweather. This would be interesting fight if it gets made, because Maidana has been known for being involved in nothing but exciting fights on HBO. It doesn’t matter who he fights, Maidana always brings out the best game in his opponent. 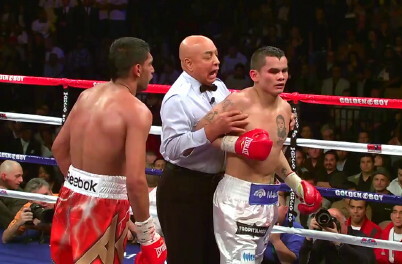 Not only is Maidana an aggressive fighter, but many boxing fans think Maidana would have beaten Amir Khan if it hadn’t been for referee Joe Cortez, who stepped in and kept getting in the way of Maidana after he had badly hurt Khan in the 10th round. Cortez wasn’t much of a fixture earlier in the fight, but after Khan was hurt and Maidana was trying to finish him off, Cortez was in the way often and did a lot of separating of the two when Maidana was trying to work in close. There’s no telling what would have happened had Maidana been able to work without the constant breaks in the action or having to try and get around Cortez to land punches against Khan. Maidana would be the perfect opponent for Mayweather to fight. Maidana has power similar to Manny Pacquiao, and the same kind of pressure style of fighting. He would make for an exciting fight he’d test Mayweather’s chin in this fight. He wouldn’t resort to headbutting like Victor Ortiz did, because he’s someone that usually stays composed while attacking. If Mayweather’s blocks his shots, Maidana will keep throwing until one of his punches get through. He’s not going to get frustrated and start fouling.